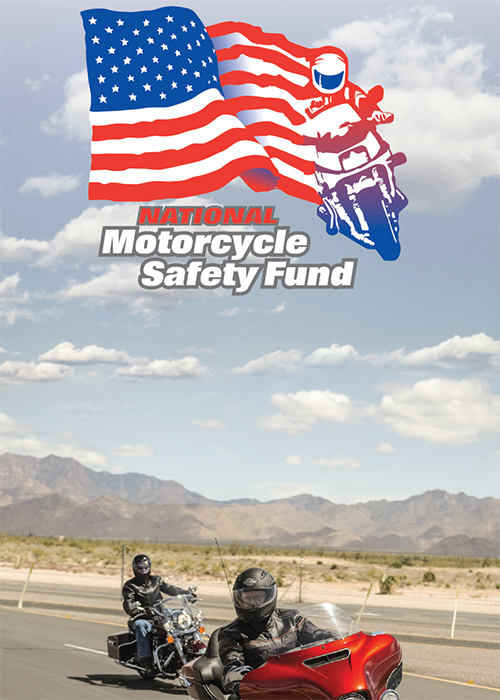 You can help support the National Motorcycle Safety Fund even further by holding fund-raising rides and events in your area or create a virtual event through social media. Go to NMSFund.org to make a donation online and create your own fund-raising page to share with friends and family. Download flyers and logos to use in your promotional materials. Let others in your community know how important it is that we work together to make motorcycling safer and even more enjoyable. To become a lifetime supporting member of the National Motorcycle Safety Fund, go to NMSFund.org and enroll in our monthly giving program. Or, make a one-time donation and receive a special gift and acknowledgement for your contribution. If you have a special opportunity in your area that you think the National Motorcycle Safety Fund should be part of, please contact us. You are the critical link to connect the National Motorcycle Safety Fund to community events and causes related to improving motorcyclist safety.